As much as the GSX-R1000 owns the racetrack, the Suzuki GSX-S1000FZ owns the road. This tour-ready sportbike carries Suzuki engine performance to the street, with technology and components packaged into a chassis designed for all-day riding comfort. The 2019 GSX-S1000FZ is powered by a 999cc inline four-cylinder powerplant with a new throttle control mechanism that helps control torque-rich power that’s ideal for street riding. It’s no surprise that this powerhouse is based on the legendary long-stroke GSX-R1000 engine, which is known for making big power through the low- and mid-range to deliver street-dominating performance. 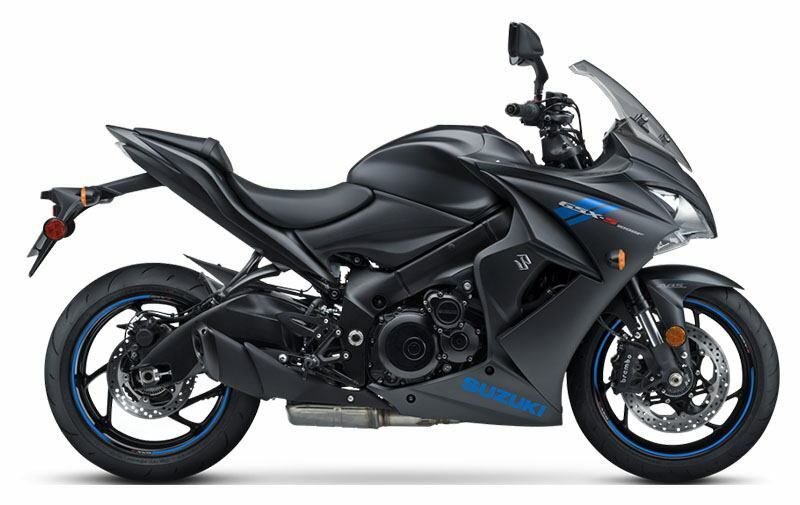 Equipped with a powerful engine, Suzuki’s Advanced Traction Control System*, a balanced KYB suspension, plus ABS-equipped** Brembo and Nissin brakes, the GSX-S1000FZ is a street bike packed with some serious performance. Top that performance off with a new, blacked out body treatment on a wind-cheating full fairing and you have a touring-ready sportbike ready for the open road or corner carving. Styled to complement the rest of the chassis and to house a bright dual headlight, the GSX-S1000FZ's full fairing slices through the wind so the rider benefits from the upright, sporty ergonomics. Lightweight and compact chassis is engineered to be agile and fun to ride for a wide range of riders. This ability starts with the low-mass rigid aluminum main frame coupled with the strong aluminum alloy swingarm. The 43mm inverted KYB forks have adjustable compression and rebound damping, and spring pre-load with a generous 120mm (4.7 inches) of front wheel travel. Link-type rear suspension, with arched aluminum swingarm and a single shock absorber featuring spring preload that is seven-way adjustable with rebound damping force adjustment. Dual front brakes with fully floating 310mm discs and Brembo Monobloc calipers with four 32mm opposed pistons provide strong and consistent stopping power. Refined front brake hoses yield improved stopping performance with better feel at the lever. Both the front and rear brakes can be modulated by a compact Anti-lock Brake System (ABS) controller to match stopping force to the available traction. Unique to the GSX-S1000 models, the TRP six-spoke lightweight cast aluminum wheels are shod with Dunlop radial tires (120/70ZR17 front and 180/50ZR17 rear). Matte black aluminum Renthal Fatbar handlebar is standard equipment offering excellent riding ergonomics with great vibration damping. The reasonable sport riding position is created by a carefully crafted relationship between the Renthall Fatbar, footrests, and seat. Black finish on the shifter, rear brake, and both hand levers matches the flat-finish of the bodywork and the performance nature of the motorcycle. The low seat height of 815mm (32 inches) contributes to the sporty yet upright riding position and aids rider confidence at stops. The GSX-S1000FZ is equipped with Suzuki’s Easy Start System that requires just a simple touch of the starter button to fire up the engine (without pulling the clutch lever if the transmission is in neutral). The dual headlight assembly in the full fairing use a pair of 55-watt H7 halogen bulbs – one for the low beam, while both illuminate for the high beam. The tail section houses an integrated LED tail light with clear lens. The lightweight and compact instrument sets uses a LCD display that includes speedometer, tachometer, odometer, dual trip meters, gear position, coolant temperatures, driving range, average fuel consumption, instantaneous fuel consumption, traction control, and a clock functions. The display has an adjustable-intensity, white-color backlight for great nighttime visibility and is flanked by LED indicators for the turn signals, high beam, malfunction, traction control, and ABS, plus coolant temperature and oil pressure alerts. The strong, four-stroke, liquid-cooled, DOHC, 999cc, inline-four engine is designed to provide smooth throttle response and controlled acceleration. Ventilation holes between the cylinders reduces pumping loss within the crankcase so the engine can deliver more power and torque. Long-stroke GSX-R engine design has broad low- to mid-range power and torque that is ideal for street riding. The profiles of the dual overhead camshafts were designed to enhance street performance while preserving peak, racetrack-capable power. Aluminum pistons, engineered with use of FEM (Finite Element Method) analysis, are cast with optimal rigidity and weight. Suzuki Composite Electrochemical Material (SCEM)-plated cylinders integrated into the upper crankcase reduce friction and improve heat transfer and durability. A throttle mechanism is used so engine response is smooth and controlled during spirited riding or cruising. The EFI system uses Suzuki’s proprietary, SDTV (Suzuki Dual Throttle Valve) throttle bodies, where the secondary throttle valves are controlled by a servo motor for smooth power delivery. Long tip, 10-hole fuel injectors on each 44mm throttle body improves fuel atomization while the automatic Idle Speed Control (ISC) improves cold starting and stabilizes the engine idle. The stainless-steel 4-2-1 exhaust system helps the engine deliver a strong low-to-mid range punch with an exciting rush to redline. The Suzuki Exhaust Tuning (SET) system-equipped mid-muffler design enhances style and aids in mass centralization for great chassis balance. The sculpted muffler has a pleasing appearance that’s not common to under-chassis exhausts while creating an exciting, distinctive sound. Suzuki’s Advanced Traction Control System* lets the rider control the throttle with more confidence in various riding conditions. As a result, the rider can enjoy sport riding with less anxiety. There are four traction control modes (1, 2, 3, and OFF) that the rider can easily adjust at rest or on the fly via a handlebar-mounted control. The difference between the modes is their sensitivity to road conditions. Mode 1 is lowest sensitivity level; most suitable for skilled riders or in conditions that have good road surface grip (sport riding on good, smooth roads). Mode 2 is a moderate sensitivity level; that is suitable for most riders or in conditions that have varied road surface grip (city riding, regular road conditions). Mode 3 is highest sensitivity level; suitable for road conditions where the grip may be limited (wet or cold surfaces). OFF disengages all traction control features. The sides of the fairing efficiently guide cooling air to the high-capacity curved radiator. Additional heat is removed from the engine via the use of a lightweight and compact liquid-cooled oil cooler (like those used on the GSX-R models). 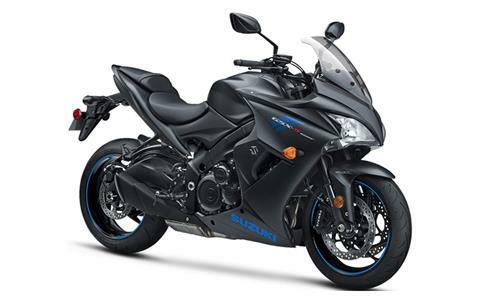 The GSX-S1000FZ brings additional style with new, matte-finish black paint that has blue accents on the bodywork and wheels. Fuel injected, 999cc, GSX-R-based engine has a new throttle control mechanism to smooth out the power delivery for 2019 to deliver a stimulating sportbike experience. Using a design similar to the GSX-R1000R, the GSX-S1000FZ’s Suzuki Clutch Assist System (SCAS) drive line smooths shifting and engine braking. Suzuki Advanced Traction Control* lets the rider select sensitivity on-the-fly so engine power to the rear wheel matches road conditions. Twin-spar aluminum frame and fully adjustable KYB-supplied suspension delivers controlled handling. Dual floating front brake rotors and Brembo Monobloc brake calipers, plus an Antilock Brake System* (ABS), deliver controlled stopping power. Recent refinements, such as new front brake hoses, yield improved stopping performance with better feel at the lever. The race-proven six-speed close-ratio transmission features vertically staggered shafts to reduce overall engine length. The SCAS-style clutch increases plate pressure under acceleration yet acts as a slipper clutch to smooth the engine response during engine braking and corner entry. This large diameter, wet multi-plate clutch uses a precise cable-activated release providing the rider with superb friction-point feel. The transmission's shift linkage helps the rider easily and quickly select the best gear for the riding conditions. The strong, RK-supplied drive chain uses O-rings to preserve internal lubrication so power is transmitted smoothly and quietly.